Given the scale involved, private financing and access to capital resources are necessary to enable governments to rise to the challenges they face. 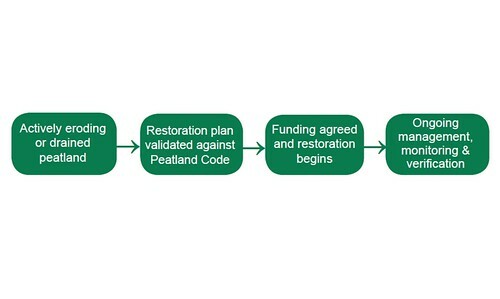 In the United Kingdom, the development of the Peatland Code looks to facilitate a market where private investors, motivated by corporate social responsibility, are given assurance that their investment in peatland restoration will return verifiable climate benefits, as assessed by an independent validation and verification body. Funding obtained provides cost-effective peatland restoration 48 and ensures the management and maintenance of restoration projects over a minimum 30-year contract. Any private funds received can help complement government-funded restoration to achieve a bigger impact. For any form of publication, please include the link to this page and give the creator credit (in this case Nieves Izquierdo Lopez) If the high-resolution file is not available, please contact grid@grida.no for request and permission for usage.